Thank you Joan, Becco and Ai. 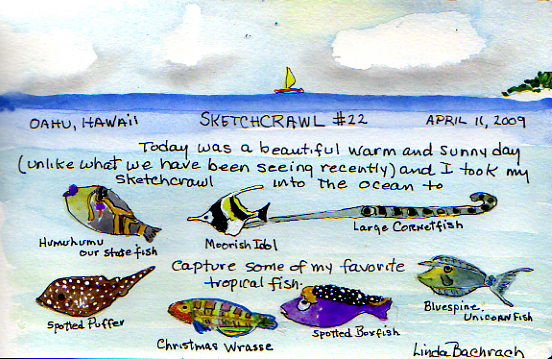 I went snorkeling and then sketched the fish. Thanks so much Ai! You have made some lovely sketches and I enjoyed looking at your website. Your autumn sketches are so beautiful! I once lived in Hackettstown, NJ for 10 years, so I felt at home viewing your sketches. PaintMonster>I am coming to Japan on Nov. 9th! I am hoping to see Autumn Kyoto on this trip, finally. I see you are enjoying the kouyou today in Sapporo. Thanks for your comment and happy painting. Only had time for a quick sketch this morning and the weather wouldn't cooperate, so fueled by Starbucks and a biscotti, I did this little sketch. Joan T - yes, those are my favorites too! We both like COLOR!